At the young age of eight, and too short to reach the kitchen counter, Michael Williams would stand on a stool to help his British mother make her famous fish and chips, shepherd’s pie, and Holiday plum pudding in their Somers Point New Jersey kitchen. Driven by his love of cooking, Williams embarked on a culinary journey that would transport him to many high profile restaurants in his home state of New Jersey. Attending the Academy of Culinary Arts in Mays Landing, New Jersey, Williams made the National Dean’s list and graduated with a Gold Medal & degree in culinary arts. Williams would then go on to teach numerous classes at the Academy over the next ten years as adjunct Instructor. Demonstrating his artistic talent, Williams soon expanded his medium and pursued courses in ice carving at Ice Works Academy in Egg Harbor, New Jersey. Rounding out his culinary education, Williams studied chocolate and sugar work at The International School of Confectionary Arts in Gaithersburg, Maryland and at the esteemed Le Cordon Bleu in Paris, France. He later furthered his continuing education studies in cuisine at ADF- Alain Ducasse Formation in Argenteuil, France, Le Cordon Bleu in Ontario, Canada, the Culinary Institute of America in Hyde Park, New York and the Blue Elephant School of Royal Thai Cuisine in Bangkok, Thailand. Williams spent fourteen years at the Sands Hotel and Casino in Atlantic City and during his tenure he held many positions, including Chef de Cuisine at the fine dining French restaurant, Mes Amis, the Brighton Steakhouse and Medici Italian restaurant. Williams played an instrumental role in the success of the restaurants and their numerous awards such as the Zagat, DiRoNA, Five Star Diamond Awards and Casino Player “Best Of” Awards. Williams was hand-selected to develop and instruct an in-house culinary apprenticeship program and supervised 23 chefs as well as 155 line level employees during the casino’s busiest seasons as Executive Sous Chef. 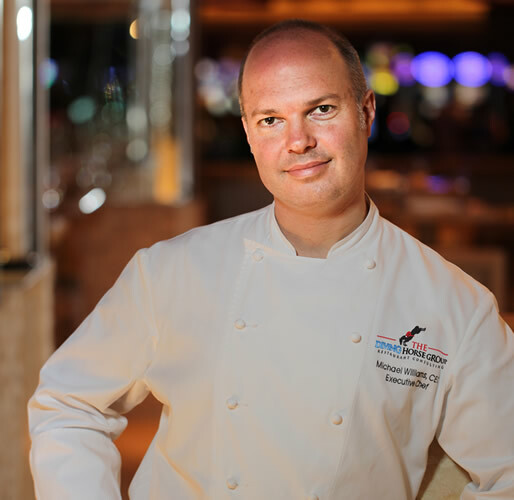 In 2004, Williams was offered an exciting position to helm the kitchen as Specialty Chef at The Steakhouse at Harrah’s inside Harrah’s Hotel and Casino. It was during this time that Williams acted as a Consulting Chef for the US Presidential Airlift Group, 89th Airlift Wing at Andrews Air Force Base, MD. In this esteemed position, Williams was responsible for creating menus and staff training for the presidential culinary programs aboard Air Force One. In 2005, Williams joined the culinary team at the Borgata Hotel Casino & Spa. Chef Williams’ first position at the Borgata was that of Executive Chef of MIXX Restaurant. There, he continued to channel his love of natural flavors and created a cutting edge Asian and Latin inspired menu. Chef Williams later created menus and concepts for Borgata’s two VIP Restaurants Amphora and Tesoro. In 2009, Williams would take the helm at Borgata’s fine dining restaurant Izakaya as Executive Chef serving enticing Japanese cuisine, sushi and robatayaki. That year, the James Beard Foundation selected Izakaya as a Best New Restaurant semi finalist. One year later, Philadelphia Magazine named Izakaya “Best Restaurant in Atlantic City 2010”. In addition to Restaurant operations, Williams has mentored the in- house Culinary Externship and Apprenticeship programs as well as overseeing Borgata’s culinary recruitments in the United States, South America, Eastern Europe and Southeast Asia. In 2012, Williams was recruited by renowned Chef Michel Richard to oversee his celebrated James Beard award- winning restaurant, CENTRAL Michel Richard, as Executive Chef. The CENTRAL menu showcases modern American cuisine with a French accent. Infamously whimsical techniques are inspired by classical preparations. In 2015, Williams founded The Diving Horse Group, a Restaurant & Hospitality Consulting firm based in Southern New Jersey. During his 25- year career, Williams has had the privilege of cooking for an impressive list of celebrities and high profile clientele. Frank Sinatra, Maroon 5, Whitney Houston, Gwen Stefani, Cher, Sting, Mary J. Blige and Vice President Al Gore, just to name a few, have each indulged in Williams creations. Williams, not just content to “fire” out his amazing cuisine from the kitchen, enjoys competing in culinary competitions all over the globe and holds over 40 desired medals and awards. Williams says, “Among my competitive medals, my most memorable are the gold medal won at the 2013 Salon Culinaire Mondial in Basel, Switzerland, a gold medal at the 2008 Internationale Kochkunst Ausstellung Culinary Olympics in Erfurt, Germany, two gold medals won at the 2004 Le Salon Culinaire International de Londres- Hotelympia in London, England and a combined seven Gold Medals & Prize Honor of the Salon of Culinary Art at the 2001 & 2002 Societe Culinaire Philanthropique in New York, NY”. Williams is also proud of his “Best of show” medals and rare “Perfect Score” earned in competition. He brings this level of precision and quality to his craft. In addition to his achievements in competition, Williams holds the recognition as Certified Executive Chef recognized by the American Culinary Federation, Certified Food Service Sanitation Manager and Certified Dietetic Assistant. Williams was nominated and selected as one of the 2009 “Top 40 under 40” dynamic young leaders in the region by Atlantic City Weekly. In 2011, Williams was nominated and selected as a semi- finalist for the American Culinary Federation Professionalism Award for the Northeastern Region. Although spare time is short, Williams enjoys running, cycling, water sports and time with family and friends.